When thinking about wireless connectivity for your businesses, it’s common to focus on speed and the range the router can cover. But it’s more important than ever to shift your focus to your Wi-Fi security. Securing your Wi-Fi is critical because it serves as the gateway to the Internet, where personal data is constantly transferred and can be easily intercepted from any device. The good news? 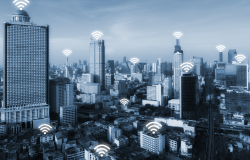 There’s a framework to help secure your wireless connections – benefitting both your business and guests alike.